The Biggest Threat to the Great Barrier Reef is … Ice Cream? The Queensland Environment Minister Andrew Powell yesterday urged Australians to boycott the much loved American ice cream company, Ben & Jerry’s. What is this lunacy, you ask? What possibly could these old, smiling purveyors of frozen goodness have done to become the focus of such political vitriol? Well, they like the reef. They like it a lot. Ben & Jerry’s recently teamed up with WWF to raise awareness of the threats facing the Great Barrier Reef, particularly from industrial projects being approved by the current government. Together, they embarked on an Australia-wide free ice cream tour urging fans to “Scoop Ice Cream, Not The Reef”. The company has a history of championing social and environmental causes, so this is hardly surprising. They have previously protested against oil drilling in the Arctic, support mandatory GMO labelling, and promote the use of FairTrade ingredients. Minister Powell lashed out at the company for their anti-dredging, pro-conservation stance on the reef. Powell argued that Ben & Jerry’s is damaging the reputation of our national treasure, jeopardising jobs and the tourist industry which is so crucial to the Queensland economy. This is interesting, given that these are the exact same arguments conservationists and opposition groups are using against the government’s development plans. According to Powell, “another company has signed up to the campaign of lies and deceit that’s been propagated by WWF”,and he’s not happy about it, warning that parent company Unilever will be getting a strongly worded letter very soon. 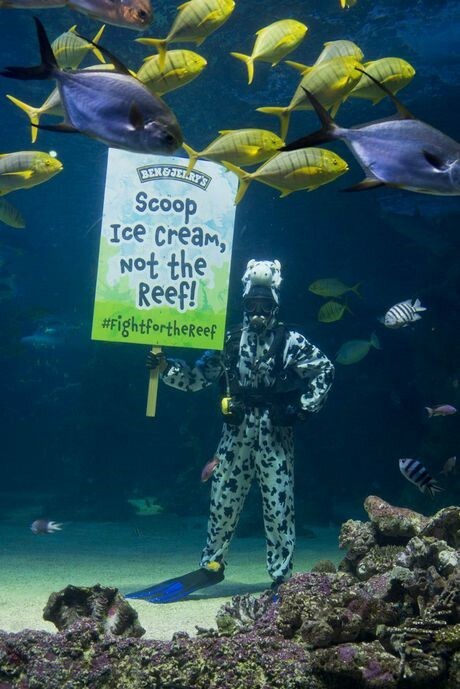 Despite the political controversy, Ben and Jerry’s Australian spokesman stood by their position on the reef stating that “dredging and dumping . . . threatens the health of one of Australia’s most iconic treasures”. 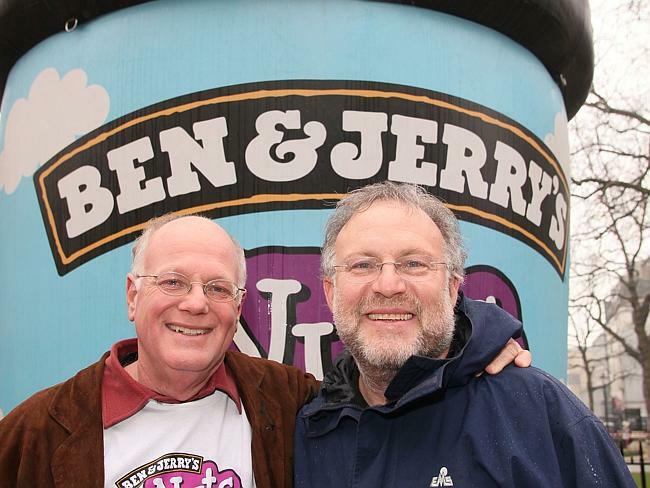 One has to laugh at the Liberals promoting a secondary boycott against Ben & Jerry’s, given that they’ve been chomping at the bit to ban environmental secondary boycotts since they came into power. It seems that boycotts are fine, as long as the targets are not the Liberal Party’s mining and logging mates. The government is clearly feeling the heat of the global spotlight on the reef and their environmental record. Along with the Ben & Jerry’s campaign, the poor health of the reef was also the focus of Earth Hour 2014. In June, UNESCO will release their report on the Heritage Status of the reef which may be downgraded to ‘In Danger’. The government is also fighting multiple lawsuits against the proposed dredging projects at Abbot Point, ushering in a new era of conservation though legal means. With such international attention, the government and fossil fuel industry are using increasingly desperate measures to defend their actions. Mining Australia’s failed ‘Australians For Coal’ campaign became the focus of online ridicule and the ice cream boycott is sure to meet the same fate. The Queensland Government’s ‘Reef Facts’ website has been deemed a misleading “political document” by scientists and are sure to contain similar misinformation. If the government and mining industry are trying to gain public support for fossil fuels, they are in desperate need of new PR people. Their anti-reef/anti-ice cream stance is alarming. Saving the reef and ice cream versus coal and environmental destruction? Tough call . . . The problem with Australians is that they have short memories and forgot why we got rid of the Liberal/Nats last time and worst of all they allow themselves to be manipulated by wealthy mining magnates who can afford the propaganda to slander anyone who wants to do anything decent for our country and it’s all pushed by world order Murdock media. Where can I buy Ben and Jerry’s ice cream in Australia? I’m with you guys.